Authors who write historical nonfiction look for stories from the past that haven't been told. A lot of untold historical stories come out of the experiences of groups whose actions have been ignored. African Americans, for instance. 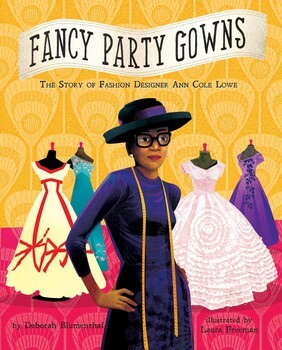 For the general public, that's the case with African American fashion designer Ann Cole Lowe, the subject of Fancy Party Gowns by Deborah Blumenthal with illustrations by Laura Freeman. Lowe is probably known within her field. She got a New York Times obituary when she died in 1981, and some of the clothes she designed can be found at The Met. She also appears to be experiencing a revival over the last couple of years. She's all over the Internet. (Yeah, you can look.) But she certainly doesn't have the same kind of high profile that designers from the same era whose design houses still exist have. Lowe designed for individuals, not the mass market, which also limited how many people knew about her, either in her lifetime or now. All of which makes her a great subject for a picture book bio. She's not generally known, but at the same time, there is information about her out there, so that when you want to hunt down more info about her, you can. Okay, Fancy Party Gowns is the story of an African American woman who was sought out by wealthy white women who wanted her to design and make their clothes for important events at a time when people of her race weren't accepted just anywhere. Like design school, for instance. She got in, but had to study separate from white students. So what we have here is a tale of an outsider who makes the insiders come to her. She had something they wanted. They wanted it bad enough to let her in the front door. Lowe designed one particular gown for one particular person, an act that ties her to history in a big way. I wasn't aware of this when I read Fancy Party Gowns and getting to this part of the book was an eye popper. Hope other readers will have the same experience. A note about the illustrations: They are both realistic and bigger than life at the same time. Lowe often appears as some variation of the cover image. In my humble opinion, it gives her power. Little Bee Books, publisher of Fancy Party Gowns, provided me with two copies of Fancy Party Gowns to give away here. I'll give away one copy this month for Black History Month and the other next month for Women's History Month. Leave a comment below. When we reach ten comments, we'll pick one at random to receive this month's copy. She designed one-of-a-kind gowns for individuals. She didn't have a clothing line, so I think that was a roadblock to getting her name out in the general public. Many of us have heard of Chanel even if we've never even seen any of her clothes in the wild, because she had a company that designed clothes to sell to the general rich public, not just individuals. And it also looks as if Lowe focused only on gowns, which was probably limiting, too. I assume the first commenter is somewhat joking, since all big-round-glasses-and-bangs designers are inspired by the legendary Edith Head. Edith Head and Ann Cole Lowe were contemporaries. Born a year apart and both died in 1981. According to Wikipedia. Thanks for highlighting this book not just for Black History Month but for Women's History Month too! I hadn't heard of her but am definitely intrigued. This looks like a really interesting book! Would love to have it in my school library. What a great book to share with my 6 year old daughter. I feel so knowledgeable because I know who both Linda Hunt and Edith Head are. Fantastic review! I can't wait to read it. I love historical non-fiction books and party dresses. This book sounds fantastic!